UD Black has quickly become a brand synonymous with quintessential high-end pulls. 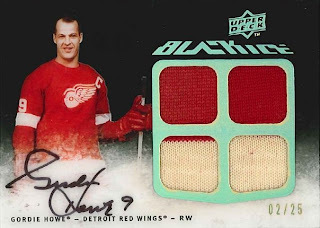 Led by Rookie Lettermen Patch cards, the supporting cast of 12-swatch gate fold cards, Pride of a Nation manufactured flag patch cards, Game Night Ticket Autographs, and Dual/Triple Trophy Winner cards, UD Black aims to delivers value in every pack. It looks like I will be selling my right kidney as well too in order to get some UD Black this year. I like it!